It's been rainy these past few days, and the show on the street has been painful to the eyes... these are this year's favorites! Ouch! 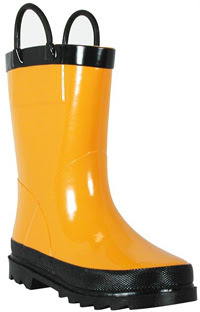 Why the classic color of rain boots is yellow is beyond my comprehension. 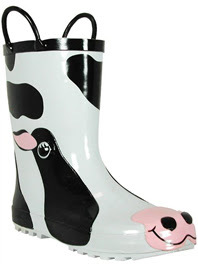 Some say it is for safety reasons: you will be easy to spot, and I answer "but it's rain, not a solar eclipse!" I'm sure someone has a rational explanation, but I still think they're ugly. 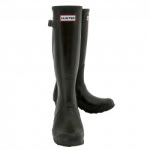 Just because it's a classic, and everyone is wearing them, you shouldn't let your sense of style slip with the rain. I love pink. But even this is too much for me. Wearing grandma's patterns on my feet is not my thing. 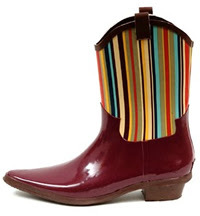 The reasoning I've heard is that a fun pattern on the boots should uplift your spirits dampened by the rain... yeah right... if I would wear these boots, my spirits would jump right in the first puddle they'd find and drown themselves. I guess these are for people that don't wear anything but cowboy boots. It's a nice hybrid, I guess. 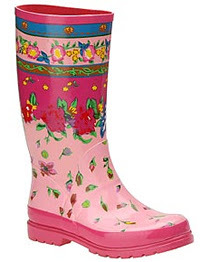 Of course they couldn't tone the pattern down... otherwise people wouldn't know they're rain boots! Ok, fine. How about a compromise? 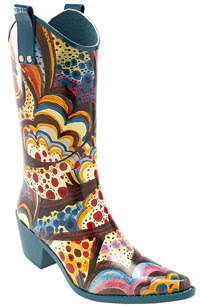 Until they come out with a better idea, these are the only rain boots I would put on my feet (by Wellington). Just browsing the internet, you have a very, very interesting blog. 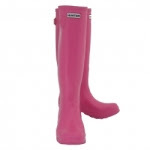 I have these! But in dark purple. The only problem is that I left them in bloody London. Nobody told me it flippin' rained in Manhattan in the summer. They are coming straight back with me after I finish shooting in England in September! 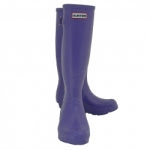 dark purple is the color I was thinking of getting, too! lol the fact that i love the yellow ones, pink ones, both cowboy boot ones, AND the cow ones and find your favorites incredibly boring...well that says a lot about my fashion sense, doesn't it? lol.